For Mike Wirth, the future of Big Oil lies at home, under the dusty fields of West Texas. As he celebrates his first year as CEO of Chevron Corp., Wirth sees the Permian Basin as a plentiful source of high-quality crude for years to come, but that’s not all. The low break-even costs to pump in the Permian are forcing Chevron to be more efficient everywhere, Wirth said, from the deepwater platforms in the Gulf of Mexico to its liquefied natural gas plants. In a time of transition, when everyone from politicians to shareholder activists is bashing Big Oil, shale’s success is forging a new reality, Wirth said: Lower your costs, or die. If not, he said, the alternative is to put money into the Permian. As Wirth prepares to present his new strategy to investors in early March, his message is one of never-ending belt-tightening, always preparing for even lower energy prices and strong competition. It’s a lesson that came from his days rising through the oil refining ranks at Chevron: Bad margins one year could turn even worse the next. It’s a popular theme with shareholders in the energy industry who saw many companies spending billions in megaprojects that never deliver the expected returns. In Chevron’s case, investors endured half a decade of intense capital spending on developments in the Gulf of Mexico and enormous LNG projects in Australia, only for the oil price to crater in 2014. Famously, at one Australian venture, Gorgon, costs swelled by almost half to $54 billion. Chevron’s stock has outperformed U.S. rival Exxon over the past three years but lags European major Royal Dutch Shell. Oil executives have talked about keeping costs low since the 2016 crash, but the last quarter was their first real test. Chevron, along with all five Western supermajors, beat expectations on earnings, producing strong cash flows in the period despite Brent crude’s 38% decline. Wirth declined to specify capital expenditure plans after 2020, a concern for some analysts, but said investors should expect “continual disciplined capital allocation.” Chevron will announce long-term capital plans at its investor day in New York on March 5. Wirth delivered last year’s version barely a month into the job. “We won’t fund everything,” Wirth said bluntly, describing two deepwater projects Chevron abandoned last year that, a few years ago, it would have invested in. Instead, Chevron is focusing on the Permian Basin of West Texas and New Mexico, the world’s biggest shale oil field where it inherited a region-leading 2.2 million-acre position as part of its merger with Texaco in 2001. The area has been transformed from dusty cattle pasture to the supermajor’s biggest global growth project in just three years. Production has surged 84% in the 12 months and now accounts for more than one in every 10 barrels Chevron pumps worldwide. The Permian is on track to be cash flow positive by 2020, Wirth said. Big Oil initially ignored shale oil, not just in the Permian but in North Dakota, Colorado and Oklahoma, with executives instead touting the majors’ ability to build megaprojects in distant countries. All that changed with the oil price collapse that started in 2014. Exxon paid $6.5 billion to expand in the Permian in 2017, and BP shelled out $10.5 billion to buy acreage there. The advantages of the Permian are manifold: a cheap source of production in an oil-friendly jurisdiction, high growth rates, low technical risk and the ability to raise and lower output depending on crude prices. 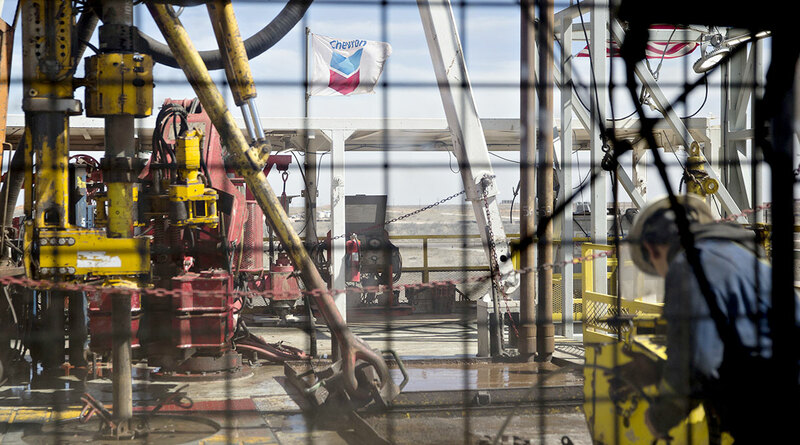 Chevron is allocating the bulk of its upstream capital expenditure to the Permian this year, which means two-thirds of its annual spending will begin generating cash flow within two years. That’s almost unheard of, and an example of disruption in an industry that typically measures its capital spending and returns over decades. It also is a protection mechanism against an evolving energy future. Short-term projects are less likely to be stranded if demand or policy changes wipe out investments. It’s a risk that weighs on Wirth, though he insists that oil and gas still have a strong future in scenarios laid out in the Paris Agreement on climate change. As such, don’t expect Chevron to follow European rivals Royal Dutch Shell and Total SA in diversifying into the power utility business as a hedge against declining crude demand.